This extension cannot work with Content Holder or old versions oF Fox Splitter (Split Browser). You must uninstall them before you install latest Fox Splitter. This was named "Split Browser", but renamed to "Fox Splitter" because there is a precursor project from 2004. Packages until 0.6.2009110501 are with the old name. Any simple extension? I don't want to split over and over. 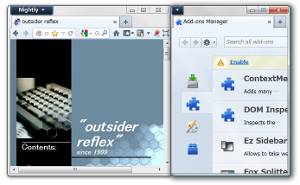 Split Pannel provides ability to show just second pane in a window. I don't want to open multiple windows, I just want to do it in a sibgle window. Tile Tabs and Tile View provide the feature. They can split browsing areas in a window. Split windows. You can split windows more and more. If you resize (or move) a member window, then others are also resized (or moved). They are synchronously raised on windows of other applications, so you don't see "wrongly backgrounded behind another application" windows. Context menu on the tab bar. "Split" button in the toolbar. Improved: Better handling about resizing and moving of grouped windows. Now, switching workspaces on Linux don't break sizes and positions of grouped windows. Improved: Add a new feature "stretch the window to the size of the group". In other words, you can hide other member windows to concentrate your eyes on a window. Improved: Keep the size of the group smaller than the screen if possible. If you are trying to open a new member window and it will be out of the screen, then the whole group will be moved and resized to show the newly opened member in the current screen. Fixed: Restore nested groups correctly. Fixed: Disable "auto hide" feature of the toolbox temporarily, while in the toolbar customization. Fixed: Free memory completely when this is disabled or uninstalled. Fixed: Fix configuration dialog about platform specific workarounds. Fixed: Don't hide the sidebar in grouped windows if Ez Sidebar is installed. Modified: Drop support for the secret preference "shouldFixActiveWindow". Now, focused window isn't shown with complete UI until you set the window as "main" manually. Fixed: Failed to detect location of wmctrl. Drop support for Firefox versions from 3.6 to 9.0. 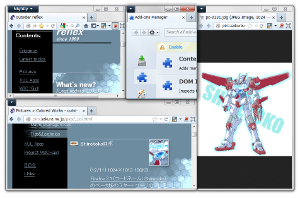 Now Fox Splitter works on Firefox 10 and later. Improved: The toolbox in split windows can be hidden/shown automatically. Improved: On Linux, control overlapping order of windows more silently by wmctrl. Improved: Add a new option to disable automatic-resizing of other windows (to keep window size ratio). Fixed: Correct UIs for some options. They didn't work correctly: "When the 'Split' button in the toolbar is clicked" and "When the 'Split window' in the Firefox menu is clicked". Fixed: Save and restore the state of grouped windows correctly. Improved: Window frames for grouped windows are now shrunken for Aero Glass (Windows Vista and later). Improved: Now we can disable "auto rising" of grouped windows. 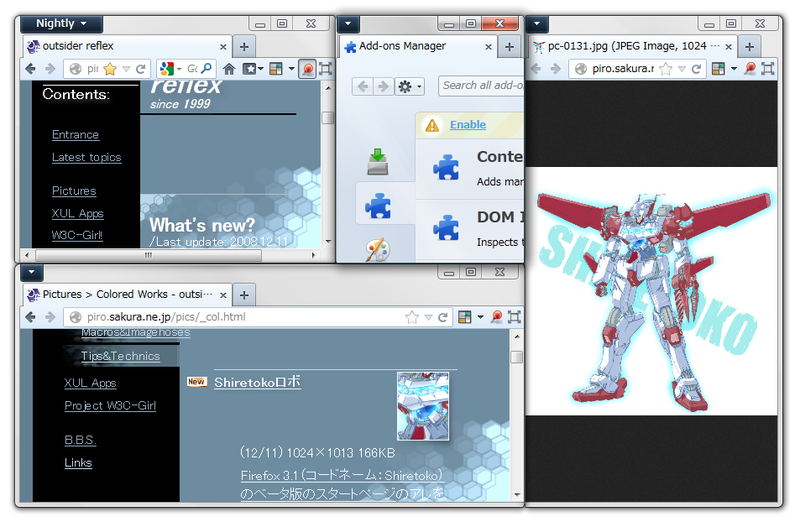 To do it, set the secret preference "extensions.foxsplitter@piro.sakura.ne.jp.methodToRaiseWindow" to "-1". Improved: Now the only one "main" window in a group has full UI and others have minimal UI, even if window focus is changed. You can change the "main" window from the menu of the toolbar button. 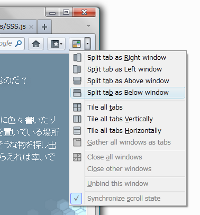 Improved: Scrolled positions of windows which are split from one tab are controled like a two panes in a window. Fixed: Used-defined keyboard shortcuts didn't work. Fixed: Works with single maximized window correctly. Fixed: While you dragging something onto any popup, Fox Splitter now doesn't show the drop position marker. Fixed: Scrolling by mouse wheel was too slow if the window was activated for "sync scroll". Fixed: Extra toolbars didn't hidden actually even if it is unchecked in the section "visible UI in split windows" of the configuration dialog. Now, they are hidden correctly. Fixed: After a split window is merged to another window, an extra blank tab was opened unexpectedly. Fixed: When this is updated, unexpectedly activated even if this is disabled by user. Fixed: Dragover on textboxes is now ignored. Fixed: Extra context menu items were not updated correctly. Fixed: Panorama was unexpectedly shown after a tab which belonged to a group was split from existing window. License of source codes was not specified. Restructured based on Firefox's window, not a custom binding. it-IT locale is updated by Godai71. Works on Shiretoko 3.5b5pre and Minefield. Supporting of Firefox 2 is dropped. Modified: Drag and drop to toolbar in split panes works like as to tab bar. Improved: For drag and drop of links, tabs and so on, the "Split" button keeps itself showing while you move the pointer. Improved: Tabs in split panes are shown in the tab previews of Minefield. Improved: Split panes are saved for each window. Improved: Now "Undo Close Pane" and "Recently Closed Panes" are available. You can reopen closed panes. Improved: Supports the private browsing mode of Shiretoko 3.5b5pre. Fixed: Works on Minefield 3.1b2pre again. Improved: Works on Minefield 3.1b2pre. Improved: On Minefield 3.1b2pre, split browsers and tabs can be moved without reloading, by drag and drop. Improved: Tabs and split browsers are more integrated. They can be moved by simple dragging, and they are cloned by dragging with Ctrl (or Command) key. Improved: Works with ReloadEvery 3.0.0. You can reload split browser automatically. Improved: Works with Tree Style Tab and Multiple Tab Handler more integratedly. 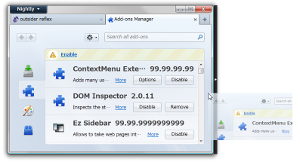 Fixed: Find in pages works on Firefox 3. Updated: ko-KR locale is updated. Fixed: Keyboard shortcuts for "Bookmark This Page" works correctly on Firefox 3. Fixed: Search results are loaded in split browsers correctly on Trunk. Fixed: Works with Second Search correctly. Fixed: "Close Other Tabs" of All-in-One Gestures works correctly. Improved: Synchronized scroll can work only for vertical scroll. Fixed: Works with Google Docs. Improved: Search result from the search bar can be loaded into split panes. Fixed: Now "Synchronize Scroll" ignores scrolling in background tabs. Verified to work on Minefield 3.0b2pre. Fixed: Now "Synchronize Scroll" ignores scrolling in other windows. Improved: "Synchronize Scroll" button is available in the toolbar of split browsers. Modified: "Back", "Forward", "Reload" and "Stop" buttons in split browsers are shown with system icon in Linux. 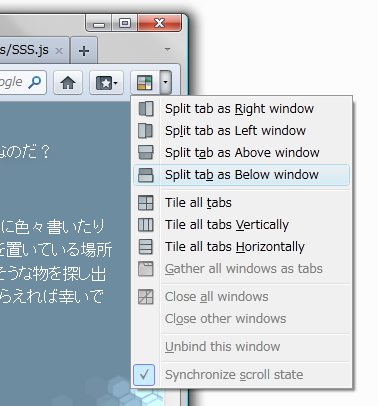 Improved: Split browsers can be scrolled synchronously with other panes. Fixed: Toolbar buttons work correctly. Improved: "Open New Tab", "View Page Source", "View Page Info", "Bookmak This Page" and "Bookmark All Tabs" keyboard shortcuts work for the active pane. Improved: "Back", "Forward", "Stop", "Reload" and "Close Tab" keyboard shortcuts work for the active pane. Fixed: Wrong locale for French description is corrected. Updated: zh-TW, ko-KR and de-DE locales are updated. Improved: Split popup buttons are shown with fade-in/out effects. Improved: You can show popup buttons only when you press "Shift" key. Fixed: From the context menu, the focused browsing area is split correctly. Fixed: "Split" command duplicates only the current tab correctly. Fixed: Labels of "Tile Vertically" and "Tile Horizontally" are switched, in following locales: en-US, de-DE, fr-FR, hu-HU, ko-KR, and zh-TW. Improved: Histories, scroll position and user typed values of forms are restored when you split the current page. Improved: Scroll position and user typed values of forms in split browsers are stored/restored. Fixed: URI strings or links are loaded in new split browser correctly when it is dropped on the popup button of the content area. Fixed: Blank split browsers from tabs disappeared. Fixed: Korean locale is updated. Fixed: The credit of hu-HU translator is corrected. Fixed: Broken behavior of "Split horizontally" and "vertically" disappeared. Fixed: Selected tabs can be tiled horizontally or vertically correctly if it works with Multiple Tab Handler. Fixed: "Tile tabs" feature closes tabs correctly even if TMP is available. Fixed: Some buttons are available correctly in the menu of "Split" button. Improved: Custom events to control split browser from web pages are available. Improved: New toolbar buttons, "Split(menu)", "Tile" and "Gather" are available. Improved: There is a new API. Scripts in webpages can split the content area. Improved: Tabs opened instead of new windows are shown in split browsers correctly. Improved: Shift-Click on relaod buttons reload without cache. Fixed: The toolbar of split browsers stay editable if the URL bar is focused. Fixed: Toolbar icons are shown at correct places. Modified: Internal operations to show/hide main menu is changed. Improved: Tab Clicking Options is supported. Fixed: Syntax errors in XUL and CSS codes are corrected. Improved: Tabs can be tiled as multi-row automatically. Fixed: "Align" are replaced to "Tile" in English locale. Improved: You can tile tabs horizontally or vertically as split browsers. And, you can gather all of split browsers to tabs. Improved: "Split" menu is available in the menu bar. Improved: You can hide additional menu items in the context menu on tabs. Improved: Works with All-in-One Gestures. Improved: Works with Multiple Tab Handler and Informational Tab. Improved: The icon is available for "Split" menus. Improved: Navigation buttons can be shown in toolbars of split browsers permanently. Fixed: Google Notebook Extension popup is redrawed when left tabs of the current are closed. Fixed: Wrongly blank "window.content" disappeared. Modified: ScrapBook toolbar and Sidebars shown by MultiSidebar are moved to outside of the content area. Fixed: Works with Google Notebook Extension. Fixed: The hack for the ScrapBook takes effect only for the ScrapBook, not other extensions. Fixed: Toolbars of split-browsers are shown even if the window is opened with no toolbar. Fixed: Error on startup disappeared. Fixed: Option dialog works correctly. Improved: The content area is made maximized correctly for maximized windows when there is any split browser. Improved: Changes of some options are applied immediately. Improved: Options of tabbed browsing are hidden if TBE or TMP is available. Fixed: Split browsers are not collapsed wrongly if you set their toolbar can be collapsed. Improved: You can show "Collapse" and "Expand" button on the toolbar of split browsers. Modified: Implementations of the feature to collapse/expand browsers are updated. Fixed: Unexpected "jumping" behavior of narrowed split browsers disappeared. Modified: Style rules for focused split browsers are modified. Improved: New toolbar buttons to collapse/expand/close all of split browsers are available. Added: Icon for the add-on manager is available. Improved: Double-click or middle-click collapse/expand a split browser, on its toolbar. Modified: Always toolbars are shown in collapsed split-browsers. Improved: The toolbar of focused split-browser is highlighted. Improved: Text-zoom feature is available for split browsers, by "Ctrl-+", "Ctrl--" or Ctrl-wheel-scroll, if the browser is focused. Improved: You can find terms in split browsers, if they are focused. Fixed: "Split Tab to" works correctly. Improved: Split Browser saves the state, which tab is selected. Improved: "Split Tab to" feature duplicates tab with session histories. Improved: A new option is available, to close tab after it is opened in split browser. Improved: You can move and rearrange split browsers by drag and drop on their toolbar. Improved: Drag-and-drop of links, bookmarks, etc. with Ctrl-key loads them in split browser even if you dropped them out of popup-buttons. Fixed: The option works correctly, to show tabs in split browser always. 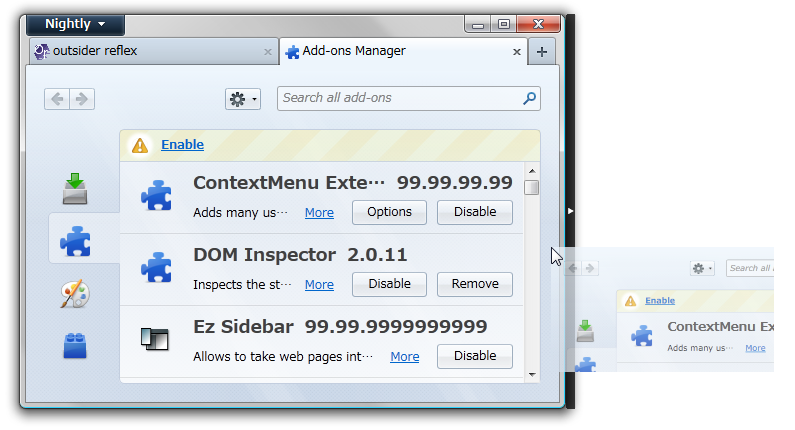 Improved: "Split Tab" menuitem is available for any tabbrowser. Fixed: Error from "Split Tab" feature disappeared. Improved: "Close" and "Collapse" are available in the context menu on the toolbar of split browsers. Fixed: A stupid mistake, "Left" and "Right" are wrongly switched in some locales, are corrected. Fixed: Unexpected spaces in popup-buttons disappeared. Modified: "Go" buttons are shown like as the Go-button in the main toolbar of Firefox 2. Fixed: Collapsed browsers are expanded automatically when a split browser beside it is closed. Improved: Session histories of split browsers are saved and restored. Improved: The title of the page is shown in the toolbar of tiny browsers. If you point the bar, "Back", "Forward", and other buttons become available. Fixed: Buttons doesn't popup if the pointer through pointer over edges of content area. Fixed: Broken order of tiny browser and splitter disappeared. Fixed: Popup-buttons are hidden after a delay correctly. Modified: Popup-buttons are shown only on middle of top/bottom/left/right edges of content area. Improved: Drag-and-drop action is available for popup-buttons. Fixed: Style rules are updated. In some environments, a progressmeter is shown behind the location bar in tiny browser.